Through the implementation of a new technology that reduces this type of waste at source and integrates it into new construction materials, thus extending the life cycle of the waste. This purpose contributes to the achievement of objectives on the Roadmap towards an efficient Europe in the use of resources and supports the implementation of the VII Environment Program. Reduce the environmental impacts associated with the landfill disposal of this waste. Reduce the environmental impacts associated with incineration techniques. Reduce the extraction of natural resources from plaster. Savings of CO2 emissions to the atmosphere. Introduce and enforce policies on environment and sustainability in the industry and construction in EU. Contributing to international cooperation. The aim is to promote sustainability in the management of PU plastic waste in the industrial sector for the manufacture of insulating polyurethanes. 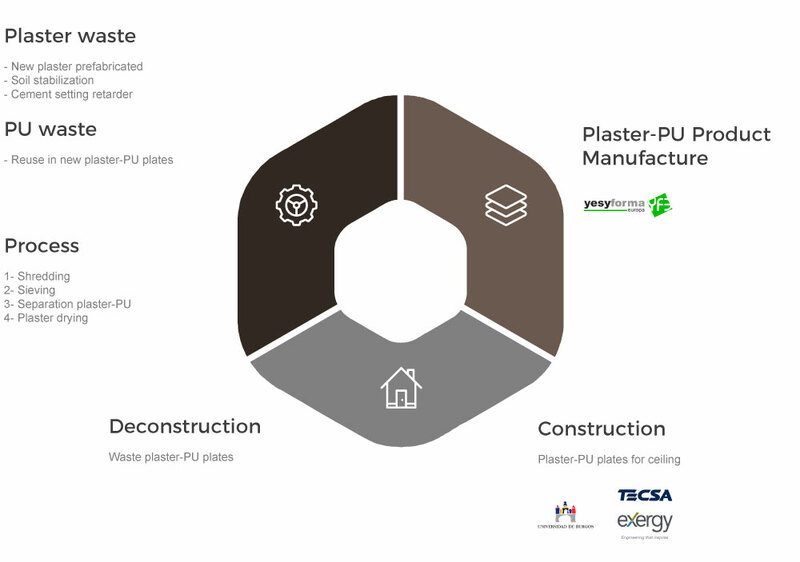 Promoting sustainable construction through the reuse of PU waste in new construction materials, demonstrating the environmental, technical and economic feasibility of reusing PU waste in new construction materials.